Between 2015 and 2018, 110,803 irregular migrants from Morocco, Algeria, Tunisia, and Libya were apprehended at sea or in littoral areas by EU nations, western Balkan states, Algeria, and Tunisia. 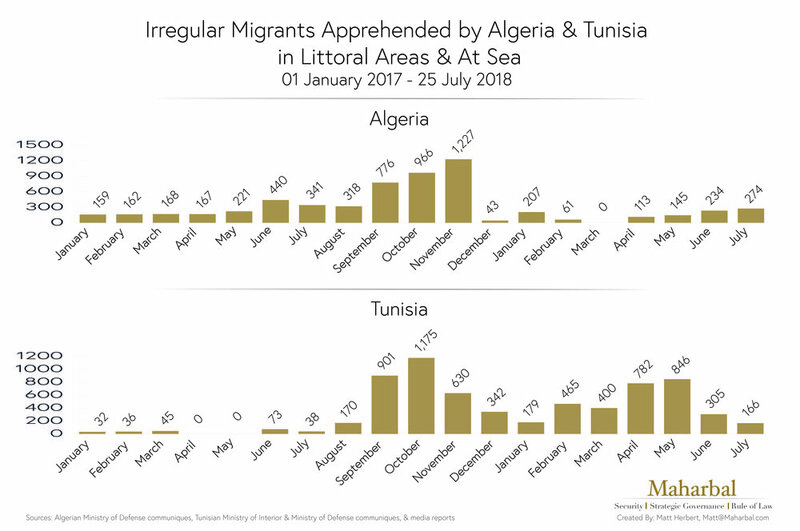 74,713 of the apprehensions took place in 2017 and 2018, underscoring the rapid escalation of the Maghrebi migration trend. Over the last several years I've conducted several cross-regional research projects on North African irregular migration, looking at drivers and the routes and means used by the migrants to get to Europe. Another project is underway, with results to be released in the Spring of 2019. In advance of that, this post offers some recent reports, articles, commentary, and media interviews I've done on the subject. “Social media bridges North Africa’s divides to facilitate migration,” ISS Today, Institute for Security Studies. Co-authored with Amine Ghoulidi (March 2019). “Algeria’s protests and migration: the fearmongers have it wrong,” ISS Today, Institute for Security Studies. Co-authored with Sofian Philip Naceur (March 2019). “AU summit 32: Maghreb’s changing politics of migration,” ISS Today, Institute for Security Studies (February 2019). "Tunisia isn’t a migrant transit country – yet," ISS Today, Institute for Security Studies. Co-authored with Max Gallien (August 2018). “Irregular Migrants & Facilitators Intercepted by Tunisian MOI & MOD (June 2017 - June 2018),” La Línea, (June 12, 2018). “The Top Refugee Issues to Watch in 2018,” Refugees Deeply (January 12, 2018). “Out of the Streets and Into the Boats: Tunisia’s Irregular Migration Surge,” MENASource, The Atlantic Council. Co-Authored with Max Gallien (November 2017). “At the Edge: Trends and Routes of North African Clandestine Migrants,” Institute for Security Studies and the Global Initiative against Transnational Organised Crime (November 2016). Naiara Galarraga Gortázar, “Italia también patrulla el Estrecho,” El Pais, 03 September 2018. Agence Presse France, “Tunisie: arrestation de 50 candidats à l’émigration clandestine,” 11 February 2018. Agenzia Nova, “Immigrazione: boom di nordafricani in Italia nel 2017, oltre 15 mila ingressi nel 2017,” 12 January 2018. Sofian Philip Naceur, “Jagd auf Migranten,” Junge Welt, 10 October 2017. Alan Clendenning and Vanessa Gera, “Rubber dinghies, old fishing boats feed Europe migrant rush,” Associated Press, 23 April 2015. The last year has seen a significant decline in irregular migrant departures from Libya and a steep rise in departures from Tunisia. This article disabuses the persistent claim there's a link between the two phenomenon, explains why, and argues that Tunisia needs an open policy debate on how to handle transit migration. Published by ISS Today, it can be accessed here.